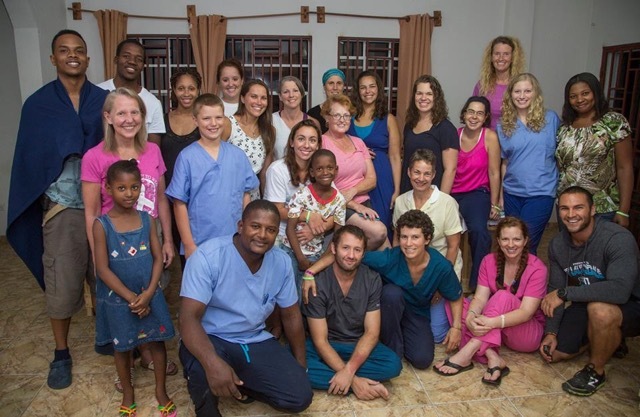 The following patient story by @DrDunawayDPT recounts an extraordinary experience from @STANDHaiti. It’s a quick read that reminded me of how lucky I am, and how valuable our service is to those in need. Familiarize yourself with Justin by reading my 2-part Interview with him here & here. 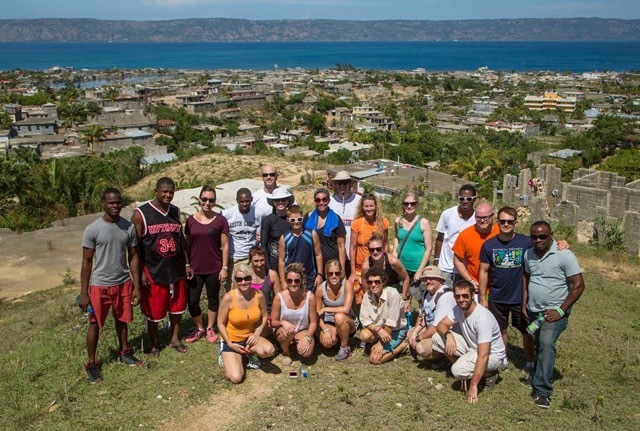 You can find a recap of the Fall 2015 STANDHaiti trip here. Are you a Physical Therapist wanting to participate in this unique opportunity? Then check out their website for more info: http://www.standhaitiproject.org/. This is not a story of superior physical therapy prowess, amazing diagnostic problem solving, or out of this world rockstar manual therapy skills. This is a story of a case so incredibly simple and fairly terribly tragic, with a mildly uplifting finish. In a system with adequate care and resources, this patient would have received emergency care, surgery, and physical therapy, getting him back on his feet with minimal to no enduring consequences. Even in the most poverty stricken areas in the United States, he would have received the care he needed to return to function. Instead, this case takes place in the incredibly impoverished streets of Port-de-Paix, Haiti, where aside from our teams periodic two week trips, there is no care or resources for the injured and poor. While in Haiti, Morgan and I have very little time to actually treat patients. Our days are consumed with the daunting and stressful task of “keeping the wheels turning”. However, we love patient care and need to take breaks to recharge and zero out, AKA treat patients. It was the third day of our trip before I could break away from logistics detail and get my hands on a patient… and I was “jonesing” to do so. I grabbed a table, a translator, and the next chart in the stack and was ready to get to work. As I read the chart that said “knee trouble” and then saw a man carry a 17 year old boy to my table, I realized immediately that, in this case, that means “I can’t walk any more”. My first reaction was: my first patient all week and there will be nothing I can do for him. I started shifting from excitement to sadness. After a very sad subjective and some graphic photos printed on computer paper, this is what I learned. The boy was brutally attacked in early July, beaten and drug through the streets. The assailant then took out a knife and very deliberately severed both the boy’s patellar tendons and left him in the street. His goal was to take away the boy’s ability to walk… and he succeeded. In the US, someone would have found the boy within a few hours of the attack. They would have called an ambulance and he would have been admitted to the emergency room. 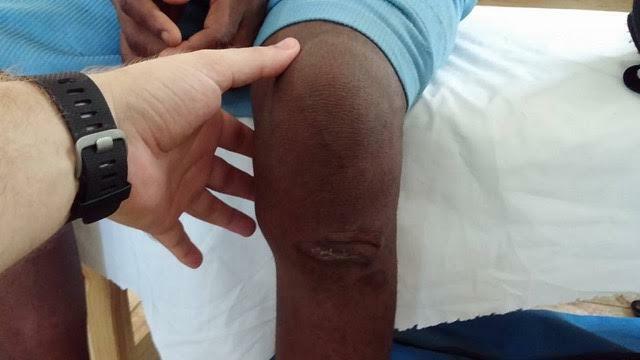 Despite living in poverty, he would most likely have Medicaid and would have received emergency surgery, reattaching his patellar tendons, and mostly have been sent to physical therapy. Over the next few months, he would have regained strength, relearned to control his knees, and returned to function. He would have returned to being a teenage boy: running, playing sports, regaining his life… but that’s here in the US. Back to Haiti. The patient was carried to my table, just as he was carried everywhere. He hadn’t stood up since his injury in July. Once a normal teenager, he has now become a burden on his friends and family, a member who cannot contribute in any way. An objective exam revealed two patellas that, in sitting with knees flexed to 90 degrees, sat somewhere in the distal 3rd of the femur. He demonstrated strong hamstrings/glutes and had maintained some ability to activate his quads, but lacked the ability to extend either knee more than a few degrees. The patient also exhibited fear of standing, depression, and other psychological symptoms from the traumatic experience. 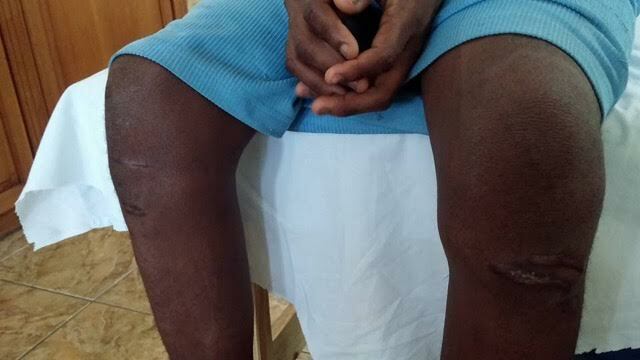 The patient expressed interest in surgery, but in this area, those services are non-existent. He took a few steps… and then a few more. He walked through the clinic, slowly and clumsily at first, and then faster and with more confidence. We walked up and down the stairs, then out on to the back patio… where he cried. These were his first steps since June, his first steps since he had given in to the thought that he would never walk again. He has a long way to go and will never be 100%, probably never get his surgery, and will always have some major dysfunction, but now he can walk. There is no brilliant PT work in this case, no medical miracle or amazing surgery, just two braces and a conversation. Here’s an update on STAND Haiti’s Fall 2015 trip by Dr. Justin Dunaway. Find out more about Justin and STAND Haiti by clicking on the blue links you just read. FYI – the next trip is scheduled for Jan 22 to Feb 7, 2016. There’s nothing like a hurricane to give you perspective. You would think that torrential rains, mud-sloshed roads, and wind gusts up to 60 mph would keep people at home. As it turns out, the care we provide in Port-de-Paix, Haiti is so valuable that the elements themselves did not prevent people from seeking care from STAND clinicians! Over the two weeks that STAND had its clinic doors open, we treated over 1,350 patients. People came to have back pain addressed, post stroke drop foot assisted, and spinal cord injury therapy plans created! New prosthetics were built for amputees, patients’ infections and maladies were addressed by our medical staff, both kids and adults received appropriate orthoses and assistive devices, and people left with less pain and more hope! Additionally, during STAND’s time in Port-de-Paix, we created jobs for 41 locals, gave medical screenings and care for school children, and provided clinical education hours for a local nursing school. Our teams of physical therapists, prosthetists, orthotists, and nurses worked selflessly to make a difference in each patient’s life. Hailing from fifteen states across the US (plus one amazing prosthetist from Leogane, Haiti), STAND’s fall team made the magic happen on levels we could never have imagined! In the end, it was our ground crew in Haiti that made this all possible. Without the hardwork and dedication of Lifaite, Gomez, and all of our support staff in Port-de-Paix, this extent of success would have been difficult even to imagine. With every cog turning and each team member working to decrease our patients’ pain and disability, STAND’s fall trip of 2015 will be one for the books! We cannot thank each member of our STAND family enough for making this trip more than just a success, for making it a memorable beginning to our growing work in Haiti. Stay tuned! Excerpts, patient stories, and therapists’ reflections are on their way! If you’re interested in joining the STAND family our next trip is Jan 22- Feb 7th and you can volunteer for 1 or 2 weeks, then please contact us at JDunaway@Stand4Haiti.org or MDenny@Stand4Haiti.org.